FIVE COMMENTARIES (click on each heading below to read more) How do we achieve tax reform in the USA? It's tough, but not impossible. Tax Deal December 2010 and the 2011 Debt-Ceiling Deal. Read how the top 2% got $74,000 per household and the rest of us got $5200 (see chart to right). Quick Fix for 2013. Read how even a 1% tax on millionaires could slash the deficit. What's wrong with a national sales tax? Alot as it turns out. Some have suggested a national sales tax, a VAT, or the so-called "Fair Tax." All are a form of sales tax - up to 30%! These taxes all give millionaires and billionaires an even bigger tax break and shift the tax burden even more onto the middle class. Comments on the 2010 Election. Mandate? What mandate? In House races the votes for Dems vs Republicans was 47-53%. If all ages had participated equally, the Democrats would have had more votes. Hardly a landslide, shellacking, or mandate. Click link to read more. How do we achieve tax reform in the USA? It's tough, but not impossible. Tax Deal December 2010 and the 2011 Debt-Ceiling Deal. Read how the top 2% got $74,000 per household and the rest of us got $5200 (see chart to right). Read how even a 1% tax on millionaires could slash the deficit. 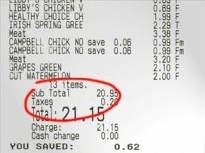 What's wrong with a national sales tax? Alot as it turns out. Some have suggested a national sales tax, a VAT, or the so-called "Fair Tax." All are a form of sales tax - up to 30%! These taxes all give millionaires and billionaires an even bigger tax break and shift the tax burden even more onto the middle class. Comments on the 2010 Election. Mandate? What mandate? In House races the votes for Dems vs Republicans was 47-53%. If all ages had participated equally, the Democrats would have had more votes. Hardly a landslide, shellacking, or mandate. Click link to read more.